- Playstation 3 on the second floor with surround sound. - Flat screen TV's in all bedrooms. EXECUTIVE ACCESS: WaterSound guests staying at this property have complimentary access to the WaterSound Beach Club, 3 community pools (including the 7,000 square ft zero-entry pool at the WaterSound Beach Club), the use of two kayaks or canoes for one hour per day, as well as 20% off stand up paddle boards at the WaterColor Boathouse and, for an additional cost, full access to Shark's Tooth and Camp Creek Golf Courses, the WaterSound Fitness center, and 2 tennis courts at both Shark's Tooth Club and the WaterSound Beach Club. LOCATION: This home is located within biking distance to the beach. 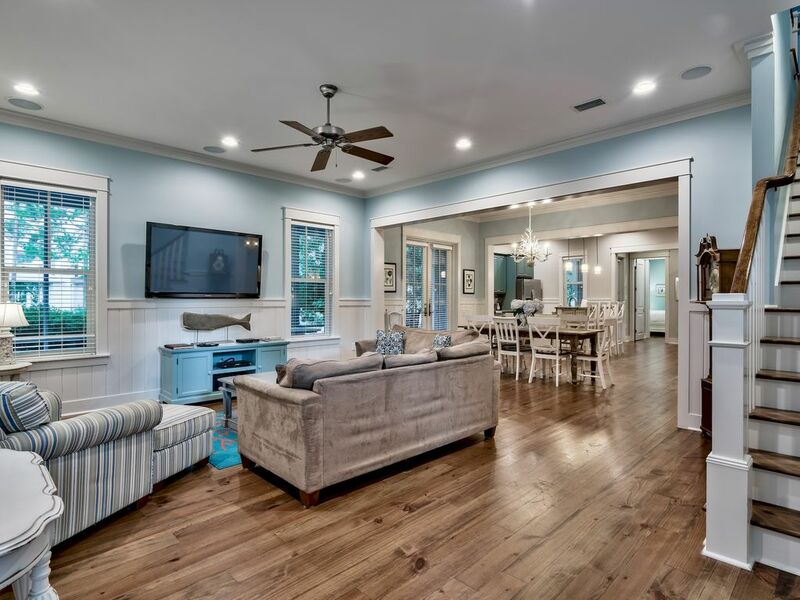 DETAILS: This brand new home offers all the luxuries of WaterSound West Beach. The home is 3,300 square feet and provides plenty of space for a larger group or family. There is over 1,000 square feet of wrap around porches, so you can sit outside and enjoy the nice sea breeze. The zero entry community pool is across the street from the home, and Blue Moon is the closest lot to the beach access. AMENITIES INCLUDE: 5 adult bikes provided, two kayaks. This property comes with 3 dedicated parking spots. Complete Clean Linen Participant - ALL linens, including comforters laundered upon every checkout. - Unfortunately due to HOA rules the guest will not be able to rent golf carts and will not be able to bring their own golf cart. - If the home you are renting has a golf cart provided by the owner then please be aware of the golf cart rules and regulations. - If we have not received the proper insurance and driver’s license information then YOU WILL NOT BE ABLE TO USE THE GOLF CART. - Lastly, if a person without a valid driver's license is found to have operated the golf cart provided, or is found driving in a reckless manner then the guest will be fined a $750.00 charge to the account provided on the reservation. We were celebrating my parents 60th wedding anniversary, and we had a great time. Home was spacious, nicely decorated, and very comfortable. Pool, bikes and beautiful beach area. It was a bit of a hike to beach, but very scenic and bikes made it easier. I would suggest bikes with baskets next time. beds for very comfy and the porches were exceptionally relaxing. I would also suggest a tea kettle in kitchen. We are so glad that you enjoyed your vacation and celebration with us in Watersound West! We agree that this home is wonderfully accommodating for everyone and having the bikes to help get around are a wonderful bonus. Unfortunately, we are not able to attach baskets to our house bikes due to the size of the wheels. We will, however, share your feedback with our entire team and we hope you are able to join us again soon! This home was absolutely perfect for our family vacation. We had a group of 10 and it fit everyone with plenty of extra space. It's clean, well appointed, and decorated beautifully. I've rented homes in Florida and all across the US, this one is one of my absolute favorites. We intend to stay again. Being walking distance from the pool and beach was such a great perk. The patios are big, well furnished, and added such a peaceful element to this trip. The beds were comfortable and the media, TV, electronics were top notch. The rental company was easy to deal with, the Hospitality App was super convenient to use, and everything went smoothly. Our only disappointment was not getting the 4 beach chairs and two umbrellas that we expected. We called in advance and 360 was unable to fulfill the request. The weather was great and we had a great time at the beach despite lacking the chair setup. Amanda did try her hardest to accommodate and I appreciated her good customer service. Overall a wonderful experience!!! We are so delighted to hear how much you enjoyed your vacation with us in Watersound West Beach! We agree that this home is a perfect option for a carefree beach getaway and the accommodations to the home is second to none. The photo you shared is adorable! We do use a third party vendor for things such as beach chairs and it is possible that they were at maximum capacity for that time. We apologize for this and will share this with our team. We look forward to hosting you all again soon! Our stay at 10 Blue Moon Lane was wonderful. The house was gorgeous, well equipped, comfortable and relaxing. We stayed in WSW in 2014 so we knew before this trip how much we would enjoy the neighborhood and the beach. It is so fun to ride bikes across the lake to go to the beach and the pool is wonderful. This was a family vacation with 4 grandparents, 2 grown children, spouses and 4 grandchildren for a total of 12 people. Lots of room for everyone! My wife, Brenda, has been vacationing in the area since 1952 (Riviera on the Gulf in Destin) and her family even went deep sea fishing with Captain Dave, so it is a very special place for her. We all agree that this is the best beach house we have stayed in! The Smith and Esposito Families are carrying on the 30A tradition!! Thank you 360 Blue! What a beautiful day to relax and unwind at the beach! We are so happy you enjoyed the home so much! Thank you for staying with 360 Blue and we can't wait to have you back again soon! Loved the community and the area! The house was nice and beautiful. The pool was fun and very clean. Staying near the pool and beach made it easy for our family. We would definitely recommend coming here and can't wait to come back. We are thrilled you enjoyed your stay in Watersound West so much! Having the pool is such a nice bonus! We appreciate you choosing to stay with 360 Blue and we can't wait to have you back again soon! This was our 3rd year in the same property which we love. The house is great with perfect spaces for a larger group gathering either in the kitchen/dining room or on the screen porch. Accommodations were great for seven adults and 5 children. The home was well equipped for cooking and love that the new Weber grill has a direct gas connection. Our only wishes were that the cleaning crew be a little more diligent in scrubbing the showers and we had one shower that was slow in draining. If all works out then we will be back next year to our beach home away from home.